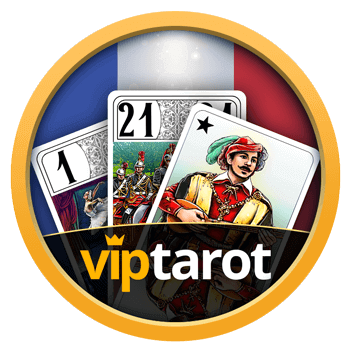 The French game of Tarot is a card game for 4 players using the traditional 78-card tarot deck. At the beginning of the round, the dealer deals the cards, 3 by 3, in a counter-clockwise direction. He also puts away 6 cards that form the « dog ». The first 3 and the last 3 cards from the deck cannot be dealt to the dog. At the end of the deal, each player receives 18 cards. The first dealer is chosen at random and in the following rounds the next player in counter-clockwise direction is the new dealer. The Small is the lowest bid and indicates that the player does not have a strong hand, and he hopes that the dog contains strong cards. The Guard is bid with a stronger hand and a higher chance of success. The Guard Without dog is bid when a player thinks he can meet the contract without using the dog. With this bid, the dog remains secret and is added to the score of the taker at the end of the round. The Guard Against the dog is bid with an outstanding hand. The player must then meet the contract without using the dog which remains secret and is added to the defence score at the end of the round. When bidding, a player can also announce a slam. He must then win all the tricks in the current round in order to score bonus points. Otherwise, he will score penalty points. A player can bid or pass only one time for the current round. The highest bidding player becomes the taker. The remaining three players become defenders until the end of the round. If no one bids, the round is void and the deal passes to the right of the current dealer. If the taker has bidden a Small or a Guard, the dog is revealed to all players. Then the taker adds the cards of the dog to his hand and sets aside the same number of cards of his choice before play begins (called the « aside »). The taker may not set aside kings, trumps and the fool, except if he cannot discard anything else. Oudlers can never be discarded. The cards set aside by the taker remain secret and at the end of the round are added to the taker’s score. The fool can be counted as trump in a handful, but when a player declares that it means he doesn’t have any other trumps (i.e. the fool can be included in a handful when the player has 9 trumps and the fool, 12 trumps and the fool or 14 trumps and the fool). All handfuls declared in a round are scored by the team that wins the round (i.e. the taker if the contract is fulfilled, or the defence otherwise). Declaring a handful is not mandatory. If the player has a Double handful, he can decide to declare a Single handful. The player that leads the trick can play the card of his choice. Players must play a card of the same suit of the first card of the trick if they have one. Otherwise, they must play a trump. If one player does not have any trump, he can play any card. When playing a trump, a player must play a higher trump than any existing trump in the trick. If he cannot, he can play any trump. The Fool may be played to any trick, instead of following suit or trumping. The Fool never wins the trick, unless it is played to the last trick and the side playing it is doing a slam. After playing the Fool to a trick (other than the last), the player who played it takes 4 points, and gives the side who took the trick 0,5 points. If the Fool is played in the last trick, the winner of the trick takes 4,5 points. If the first card played in a trick is the Fool, the required suit to follow is determined by the following card. The player that wins the current trick leads the next one. The ranking of the hearts, clubs, diamonds and spades from the top is: King, Queen, Knight, Jack, 10, 9, 8, 7, 6, 5, 4, 3, 2, 1. The ranking of trumps is from 21 (the highest) to 1 (the lowest). Three cards known as oudlers are of particular importance in the game: the 1 of trumps (called Petit), the 21 of trumps, and the Fool (Excuse). These cards, when won by the taker, lower the point threshold needed to fulfil the contract. When the one of trumps is played to the last trick, the team that won the trick receives a 10 points bonus, multiplied by the value of the contract. If a side is making a slam, where the one of trumps is played in the second last trick and the fool in the last, the Petit bonus is counted. The round ends when the last trick has been played. The taker counts the number of oudlers and the point value of all the cards he has won. The score of each player is then updated, and a new round starts, until the end of the game. A game finishes when a given number of rounds has been played. This number is fixed at the beginning of the game. If all 4 players pass, the round is not counted. Then the winner of the game is the player with the highest score. If two or more players are with an equal highest score, an additional round is played. The total value of points in tarot deck is 91. Kings and oudlers are worth 4.5 points each. Queens are worth 3.5 points each. Knights are worth 2.5 points each. Jacks are worth 1.5 points each. All other cards are worth 0.5 point each. At the end of the round, the taker counts the number of oudlers and the point value of the cards he has won and the cards of his « aside » or the cards of the dog if he has bidden a Guard Without. When the taker plays the fool in a trick other than the last, it’s considered won by him and thus lowers the points threshold. With 3 oudlers the taker needs at least 36 card points to win. With 2 oudlers the taker needs at least 41 card points to win. With 1 oudler the taker needs at least 51 card points to win. « S » is the difference between the card points won by the taker, and the card points needed to fulfill the contract (in absolute value). « p » is worth 10 if the taker has won the one trump on the last trick, -10 if the defense has won the one trump on the last trick, and 0 otherwise. « c » is the contract multiplier. It is worth 1 for a Small, 2 for a Guard, 4 for a Guard Without, and 6 for a Guard Against. « H » is the total point value of all declared handfuls. « Sa » is worth 400 if the taker has bid and done a slam, 200 if the taker has done a slam, -200 if the taker has bid a slam that has not been done, and 0 otherwise. « Sd » is worth 200 if the defense has done a slam, 0 otherwise. If the taker has fulfilled the minimum card points, the calculated points are won by the taker from all three opponents. For example, if the taker has 80 points, his final score is 80 * 3 = 240 points. His opponents score -80 points each. If the taker has not fulfilled the minimum card points, the calculated points are lost by the taker from all three opponents. For example, if the taker has 70 points, his final score is -70 * 3 = -210 points. His opponents score 70 points each.